Valentine’s Day is about love and affection. Whether it’s a simple heartfelt note, a box of sweets, a dozen red roses or a bottle of expensive champagne, there are endless ways to express those special feelings. However, this year, we’re hoping you can offer one rose (or maybe two) to a special set of precious animals that are quickly becoming an endangered species and in need of your love the most. We’re talking about wild horses and burros. For the last 20+ years, thousands of wild horses roaming our public lands out west have been hit hard by the government’s giant bow and arrow, stripping away protections and giving away public lands to big oil, big cattle and every other big special interest imaginable. 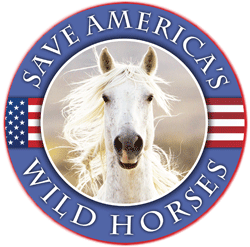 The federal government has taken away more than half the land wild horses once occupied and using cruel helicopter round-ups and other means to eliminate wild horses altogether. This Valentine’s Day, we have an opportunity for you to shower your loved one with a special gift AND help protect these beautiful creatures – a beautiful photo book of wild horses taken in their natural habitat on public lands. Proceeds from this unique book benefit the Wild Horse Freedom Federation, which works tirelessly to protect wild horses and burros on public lands and expose how the federal government is secretly, behind-the-scenes implementing policies they know will result in the extinction of wild horses.